We woke at 4.45 to get some distance in before the sizzling sun hit us again. The scenery and hiking was magnificent down here but the heat- was brutal! The trail now though was excellent, contouring up above the river on sandstone terraces (the tapeats rock layer). The sun hit us alarmingly early, so we pushed on quickly before the heat built up too much. A stop at Lava Creek, where the trail drops about 1,000 feet to the main Colorado river, was pleasant as we arrived back into the shade. From there we hiked closer to the river and saw our rafts from yesterday float by. The rafting looks fun but despite the heat, this hiking adventure is the way to go for us! We passed the Tanner Trail campsite and another three miles on to Cardenas Creek. Here the trail climbs up away from the river for a few miles but the heat was too much for us to consider doing that in the afternoon, so we stopped under some mesquite bushes next to the river for some meager shade. A few hours were spent dipping in the river and lazing in the semi-shade. Haze came in – possibly from a nearby fire- although it didn’t cool the air much! We had dinner at 5pm and decided to hike on another 7 miles in the evening to the junction of Escalante Creek at the Colorado, which would give us a good camp with the Colorado river as a certain water source. We set off at 6pm in deep haze with an orange globe of sun just penetrating through, but it remained sweaty and muggy. The terrain had a Mars like feel to it – exaggerated by the red haze. The character of the hiking here is unique as we climbed up the jaggy Escalante ridge with hazy views back down to the river. 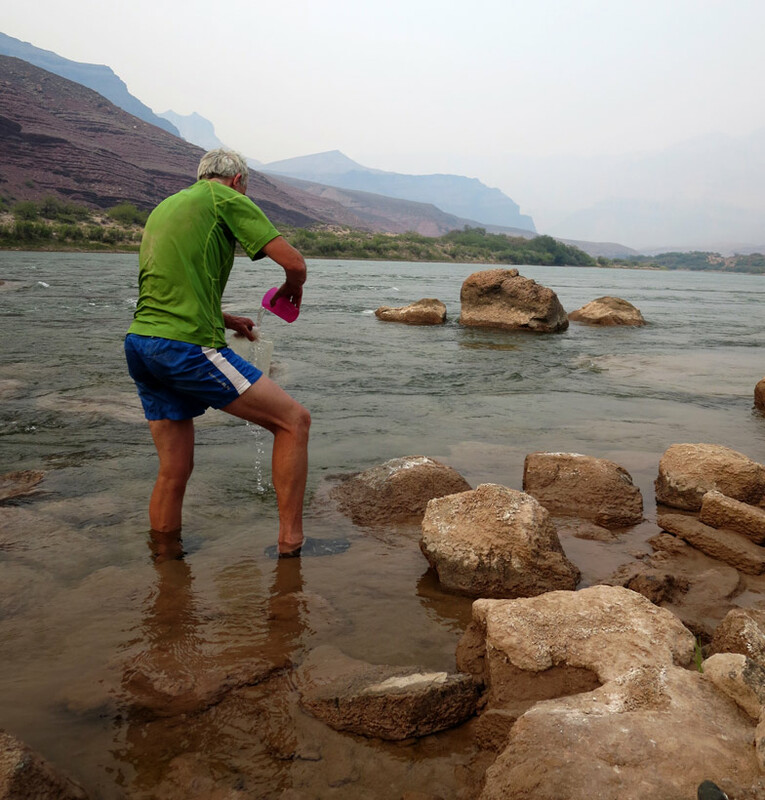 We walked at a flat out fast pace to make it back down to the river to camp before dark. Descending from the ridge on red soil we reached the black depths of Escalante creek which provided an enjoyable and surprisingly easy route down to the river. That was a great evening hike- we would love to do it again in clearer weather! Made it to a descent campsite just as it got dark! Awake early again at 4.45 am feeling fatigued after some hard, hot days! It was a rough little trail bordering the rim of 75 mile canyon, which we had to deviate round then drop back down into to reach the Colorado again. 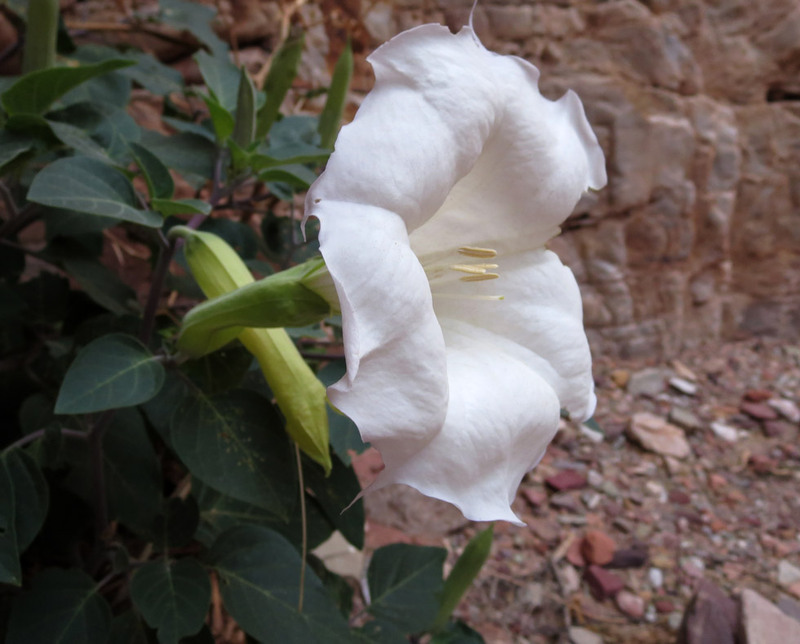 The walls of this narrow canyon were a lovely smooth quartzite and there were fantastic large white datura flowers growing here (great looking flowers that give out a scent at night to attract moths). 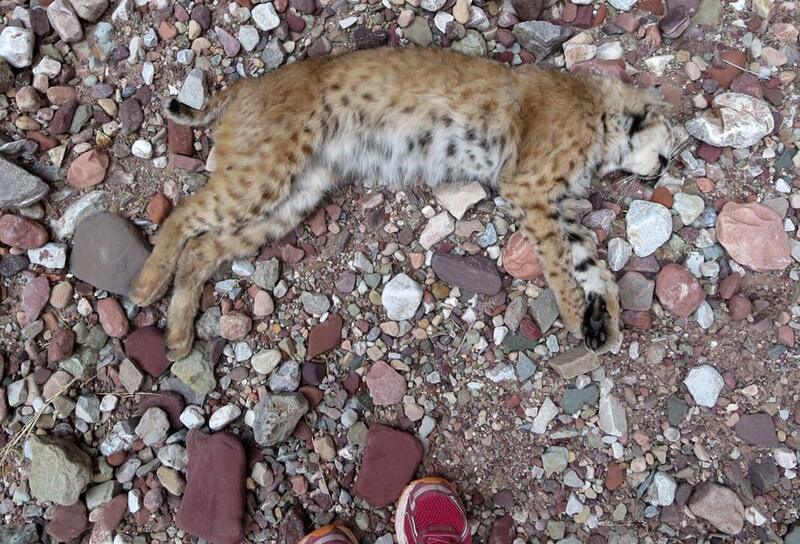 Wow- we then came across a fresh dead bobcat lying in the base of the canyon. It looked like it might have fallen from the rim down the cliff, poor thing. [We reported the Bobcat to the National Park when we reached south rim]. 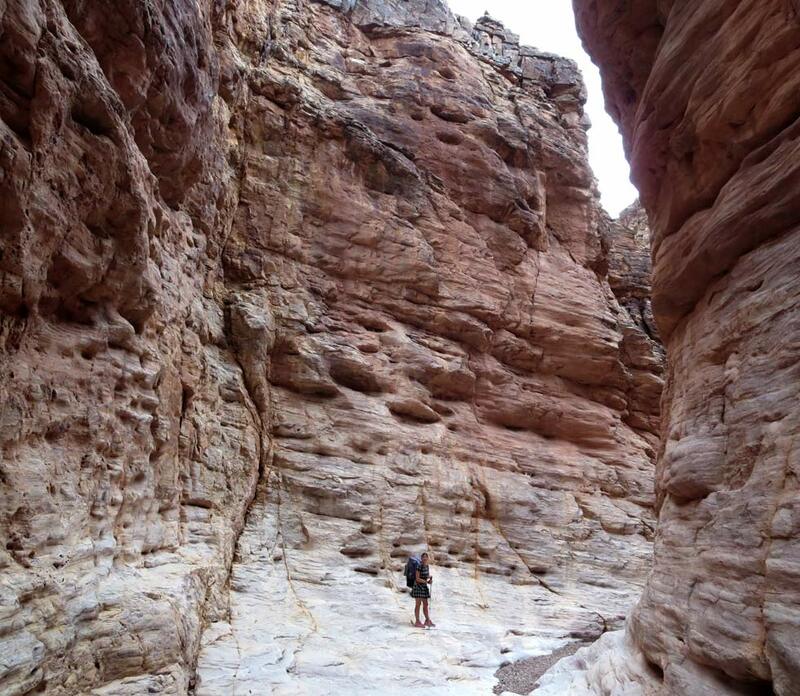 75 mile canyon opened out to the Colorado river again and we scrabbled along a great route following the river downstream including a steep climb at Papago canyon before a loose steep gully descent back to the river. A short trail along the river then led to Red Canyon, a lovely spot used as a campsite by rafters, where we took a rest and collected water from the Colorado. 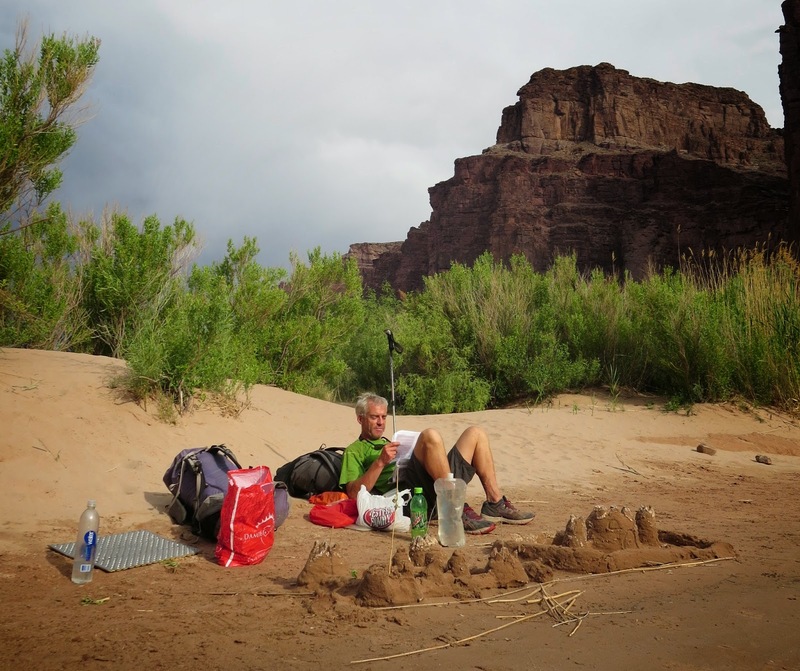 Relaxing at the beach at Red Canyon for ‘mid morning snacks’ at 8am ! 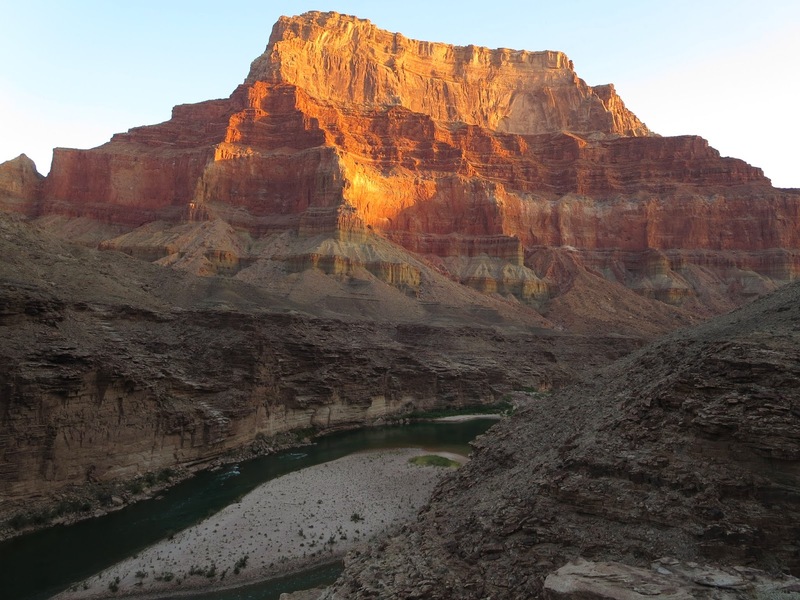 We now said farewell to the Colorado river for a while as we followed a good climbing trail (the Tonto trail) as it steadily ascended upwards on baked terraces with boulders, cactus, agave and big views. We made it to Hance creek around lunchtime with it’s small water flow amid cottonwood trees. 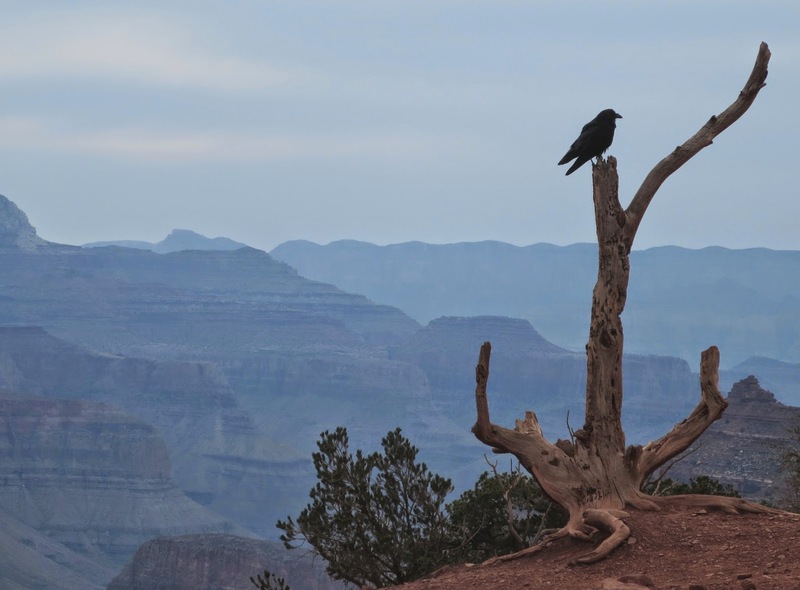 There were campers here, our first other hikers seen in the Grand Canyon! Next up we climbed for about 1.5 miles past Page/ Miners spring. 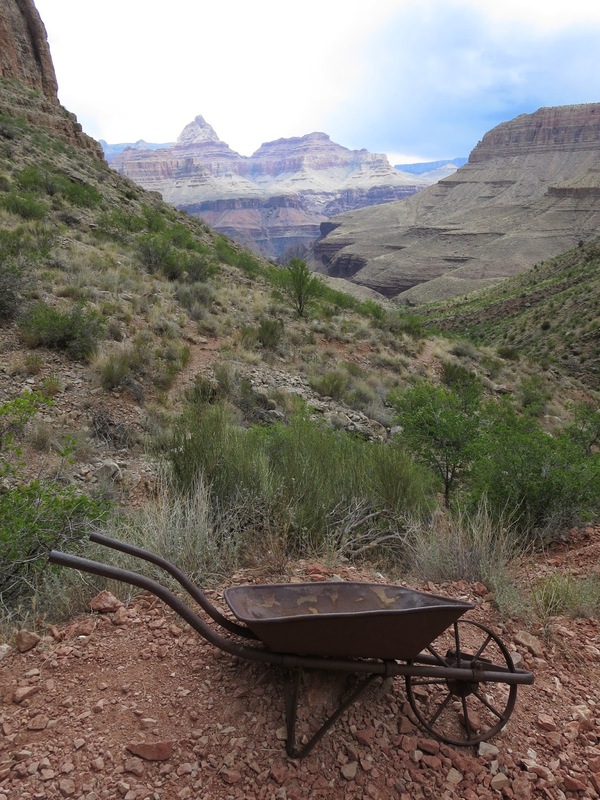 Copper and silver were mined in the canyon in the 1890’s and there are some interesting relics around. Climbing up to the flat area of Horseshoe Mesa was fun and we then dropped steeply back down again into Cottonwood Canyon. On discovering a tiny trickle of water under cottonwood and junipers, we declared an early camp here to rest in the shade and take on more water. It stayed cloudy in the afternoon even threatening thunder which was great for us and we could relax at camp out of the fiercest heat! A great evening in camp with some distant thunder and rain to cool things down. Both of us were tired- we went to sleep at 7! With an alarm at 4.30 am we were off hiking into the dark at 5.30 am with head torches. It was light enough at 6 am though as we left Cottonwood Creek and headed westwards in a huge arc on a plateau (the Tonto) way above the Colorado river itself. 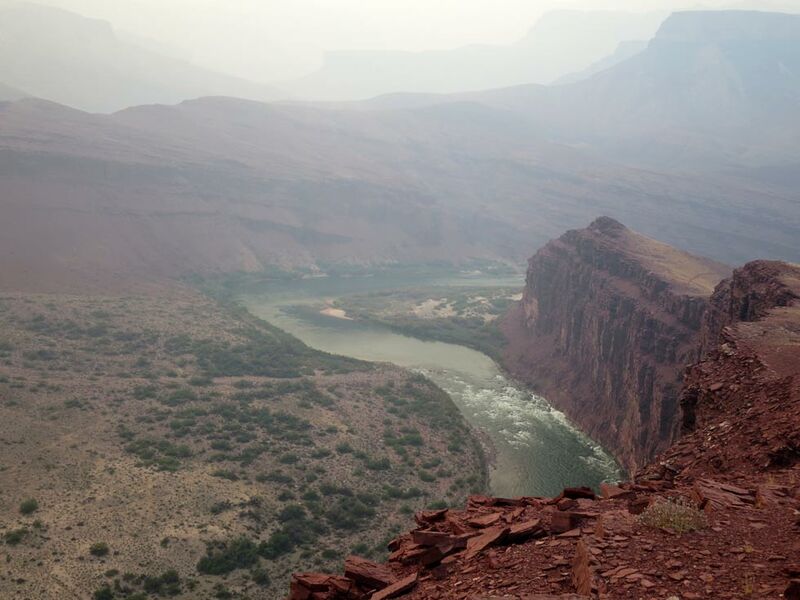 There was a good trail on flat terrain which made for easy hiking and the most interesting sections were when we could look down from the cliff edges into the black depths of the Colorado. Six miles in and we reached Grapevine Canyon – a potential water source. We split to look for water; Brian went down canyon on slick rock and Martina up canyon to successfully find some pools of water. Another 4 miles in and we found shade to rest in Boulder Canyon. The weather built up a bit and it didn’t heat up too much – which was a relief as this is frying territory! 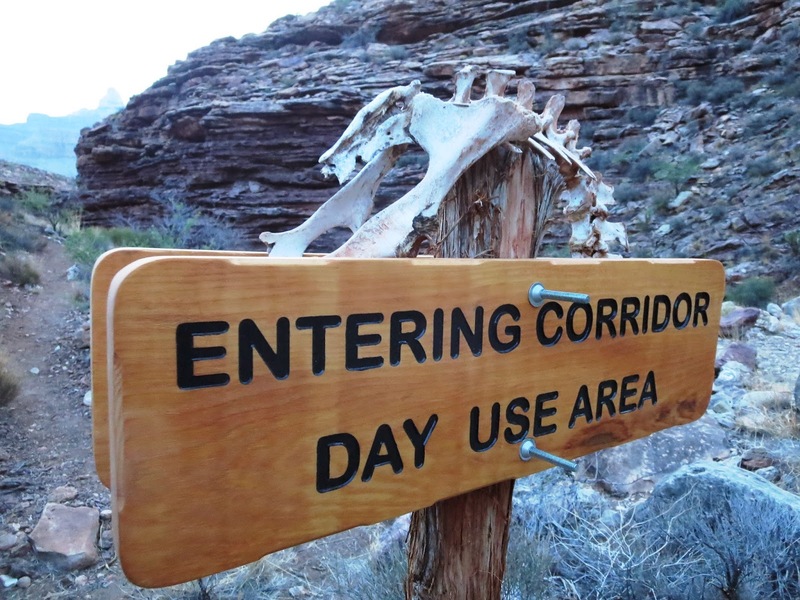 From Boulder to Lonetree Canyon (our intended camp) was easy flat hiking with some bighorn sheep along the way. Arriving at Lonetree we were delighted to find some small pools of water as this was a critical water source which we had heard dries up in early summer each year. We happily lazed around here in late afternoon watching frogs, lizards and chickadee birds at this little oasis. We decided to walk on around 5 pm stocking up with enough water to do us overnight and tomorrow before reaching the south rim of Grand Canyon along with its shops and plentiful water! Our trail continued on quite a burnt out, dry, desert landscape along the flattish Tonto plateau still. 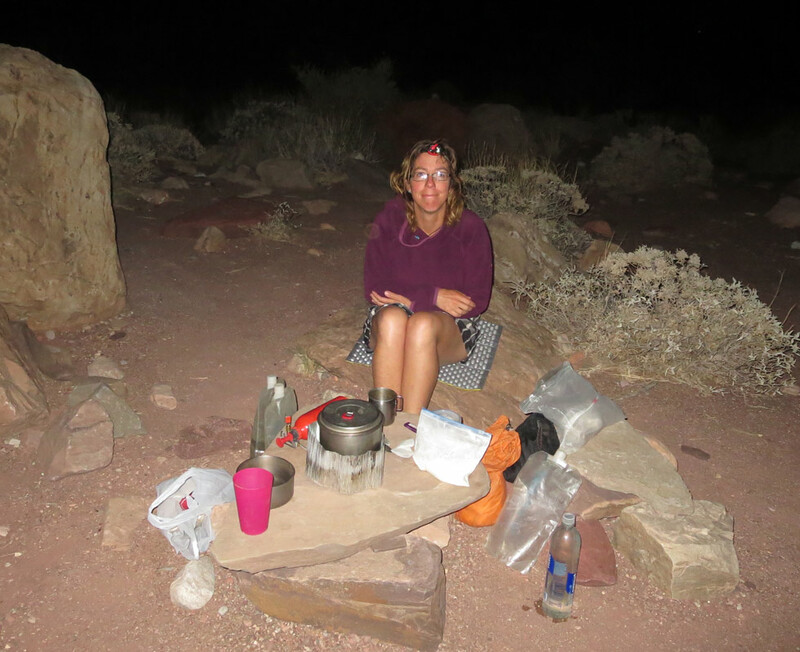 On reaching the dry Cremation Creek we found a pleasant camp spot and, since we aimed to reach civilization tomorrow, we splashed out by scoffing our spare energy bars with tea after our pasta dinner- luxury! Both of us are looking forward to showers and fresh food! 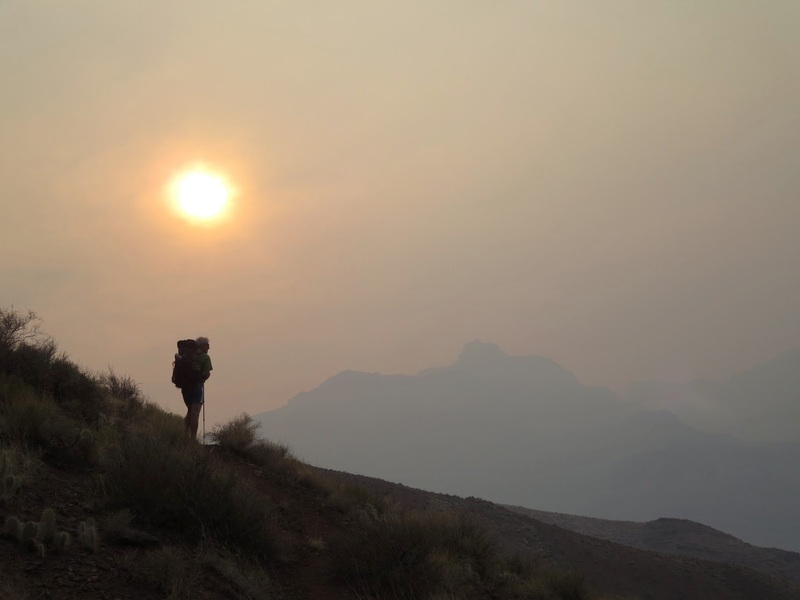 Another early start to beat the heat, hiking out with head torches and adrenaline pre-dawn. 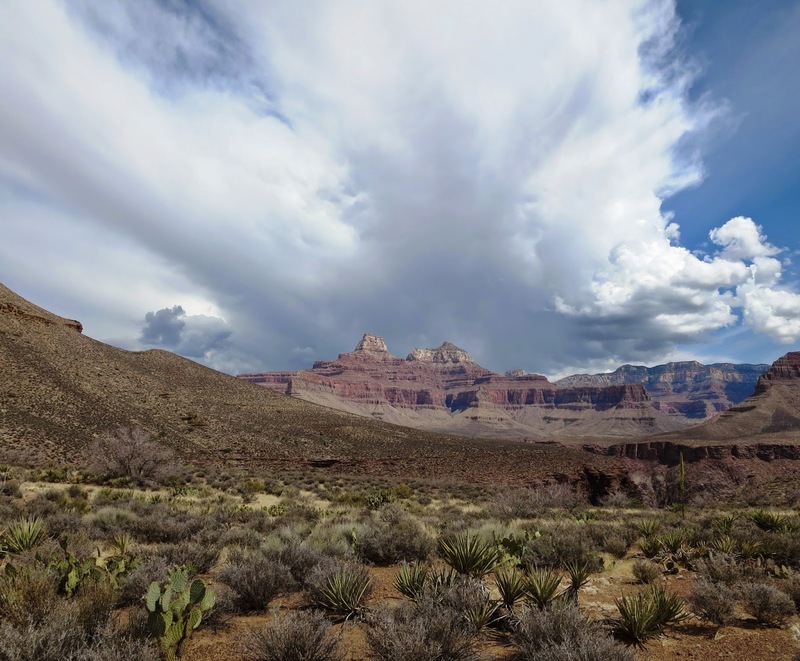 This has been a tough, too hot, but fantastic hike and we push on fast along the flat to meet up with the very popular South Kaibab trail. 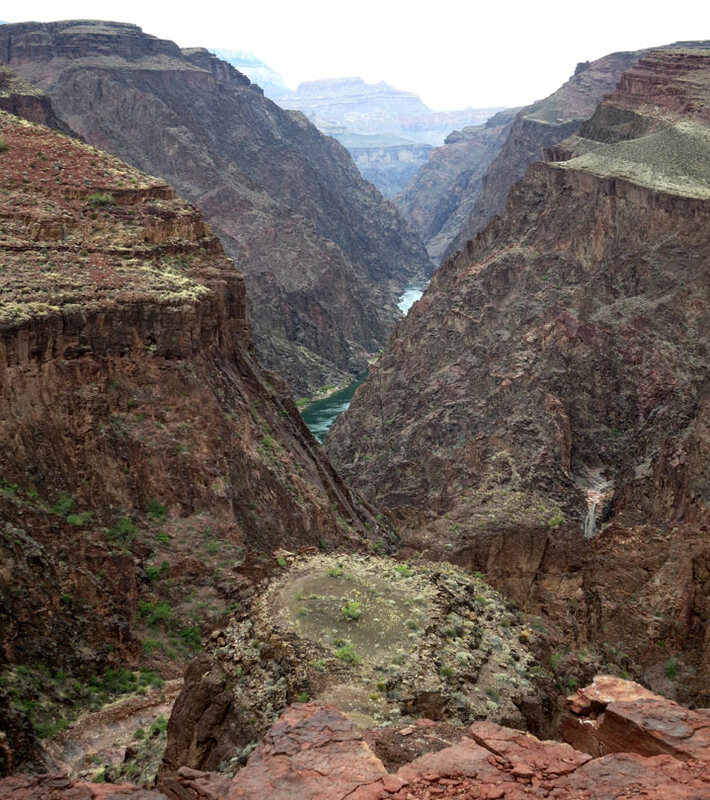 This is the normal way for people to hike down from the Grand Canyon rim to the depths of the Colorado river some 6000 feet below. There are other people around now as we turn south to ascend up the well worn trail for 4000 feet of climbing to the south rim, roads and town. We have light rucksacks with little food left, are now lean and fit and we charge up the trail at a fast pace, meeting trail runners, mule trains and lines of hikers of all shapes and sizes coming down in the opposite direction. We reach the summit rim at 8.30 am to relax after a wonderful, but draining hike!